With the new year literally days away, why not consider a new look for your backyard? Well-constructed walkway landscaping not only can add a splash of sophistication to your property, but it also can increase your property value by thousands of dollars quickly. Walkways can be either straight or curved, and they can be formed by several different materials. 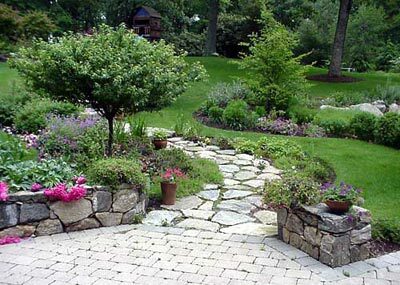 Walkways can come in concrete, brick, gravel, crushed stone or even shredded bark or mulch. Many families with walkways also own flourishing gardens. Those with gardens who do not have walkways should strongly consider the idea, as they serve as a path for you to manage your flowers or produce effectively, without having to get dirty in the soil surrounding it. Concrete or brick stone walkways are the easiest answers, as they require minimal maintenance (totally the opposite for mulch walkways). Because of this, they arguably are the most expensive walkway material to purchase, and they also can be heavily labor-intensive. Trained professionals usually are the ones who install these walkways. Mulch may be more inexpensive to install than gravel or crushed stone, but mulch will require more maintenance as the wood eventually could deteriorate with inclement weather conditions. Our landscape design company in Fort Worth TX specializes in all kinds of walkway installation. We know that a properly installed and managed walkway can improve your outdoor living arrangements. Call our landscaping experts today, or contact us online for more details.